"Four boys singing in church is the funniest thing I've seen. Keep your eyes on the boy in the vest..."
Ok, this really was one of the best-executed humor videos I’ve seen… and I’ve been around, believe me! Kudos to the talented boys who put this together. These kids are great, but I get a bigger kick looking at the faces in the choir behind them. Oh boy!! I haven’t laughed that hard in a long time. I sure needed that, too. The recital begins typically enough. A beautifully decorated stage creates an ideal backdrop for the Christmas scene. Each member of the audience was waiting for what they assumed would be a delightful, although typical seasonal church performance. The 4 boys arrive on stage all dressed up wearing black pants, white shirts, and a tie. Then it happens! Hilarity ensues! Keep your eye on that one with the vest – Not that you could miss him and his hilarious antics! What starts out as a traditional gospel song becomes funnier every minute. The boys obviously are having a great time. The audience is in stitches. 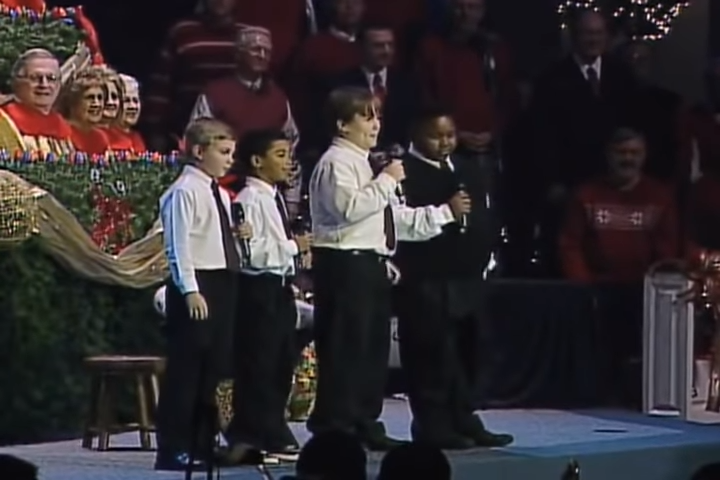 These 4 boys were able to worship and joyfully entertain, bringing the congregation to tears of laughter! Who says there is no longer clean humor that’s hilarious nowadays? These kids are great. They really made my day. Check out this hilarious Christmas performance to share in the fun. Absolutely amazing!!! I could hardly stop laughing! If they made you laugh, share this video with a friend.